That was the week that was!!! 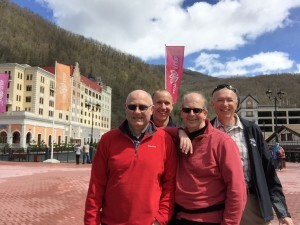 As we approach the part of the competition ( ie the post game celebrations) where ‘what goes on tour, stays on tour’ especially for Neil, an update blog from the Finals which are in progress. What a day, yesterday!! The task facing us was pretty daunting to be honest but we were up for it. You might have been forgiven for thinking that we didn’t want to progress the way the skipper started the tiebreaker against the Czechs , missing a couple of easy takeouts . There was no panic in the camp tho as we felt that we were playing well and it was only a matter of time before we gained the upper hand which we did. It would have been great to have finished the game early but the Czechs stuck in and took us to the eighth. The final 7-6 score line flattered them somewhat as we were 7-4 up with the hammer and the skipper just had to remove one of their stones to complete the game. 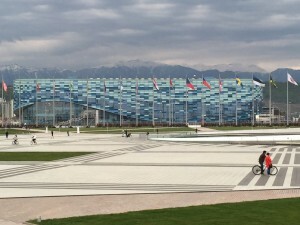 We only had a very short break of around an hour and a half before our QF qualification game against the Australians, just enough time for yet another walk round the Olympic Plaza and for Neil to take some more photographs of the Iceberg building to go along with the two hundred or so that he had already amassed!! Then it was back to the curling hall for the next instalment of the incredible journey!! The game against Australia was a pretty tight affair. We started well forcing a one in the first and then we coughed up a steal of two in the second to continue our run of poor starts overall. We collected a two in the third which could have been a three but Bill’s attempted hit and stick just rolled out a bit. We then finished the half well by stealing a single to go in to the break all square. We felt at that point that we were outplaying them so were happy at that point. We forced a single in the 5th and scored one while trying to blank the 6th. In the 7th were were lying really well to force the single again but Bill’s last stone attempted hit picked halfway up and found what looked like too narrow a gap between two stones to leave Hugh Milliken with a simple draw for two. 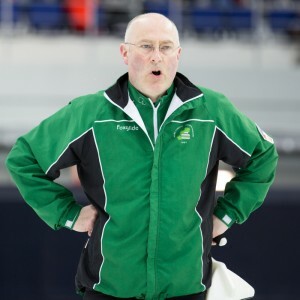 The momentous last end was not really going our way at all for a long while but although the Aussies were lying one with one of our stones counting 2nd shot, Bill elected to freeze in the back corner eight foot to try and make something happen and did it ever happen!!! The opposing skips attempted hit was some way wide of the mark and only succeeded in rolling across the house in to the open and left us lying two with a hit for a three. A well swept hit followed and the win was secure. An absolutely fantastic result for the Fab Four to acclaim from the watching crowd. This was a performance which ultimately proved to be our ‘Final’. The emotion and adrenaline buzz from winning that game was not far short of some of the experiences of Tårnby. A further short break made even shorter by the now legendary speed (or lack of it) of Russian table service and the boys wee back on the ice for the quarter final against USA. Right from the off it became apparent that the previous two games had begun to take their toll, particularly for David Hume who was struggling with tiredness and we eventually persuaded him to retire after the 5th end. By that time it was clear that we were up against a very focused, capable and fresh USA outfit. We played manfully through the pain and tiredness barriers and had a glimmer of a chance in the 6th end where we were lying really well and had a hit through a narrow port to lie 3 and guarded.This time it was the skip’s turn to succumb to the rigours of the day, struggling to get the up weight hit away and caught the guard allowing the USA to draw for two. That was probably the final nail In the coffin as the USA went 6-2 up. 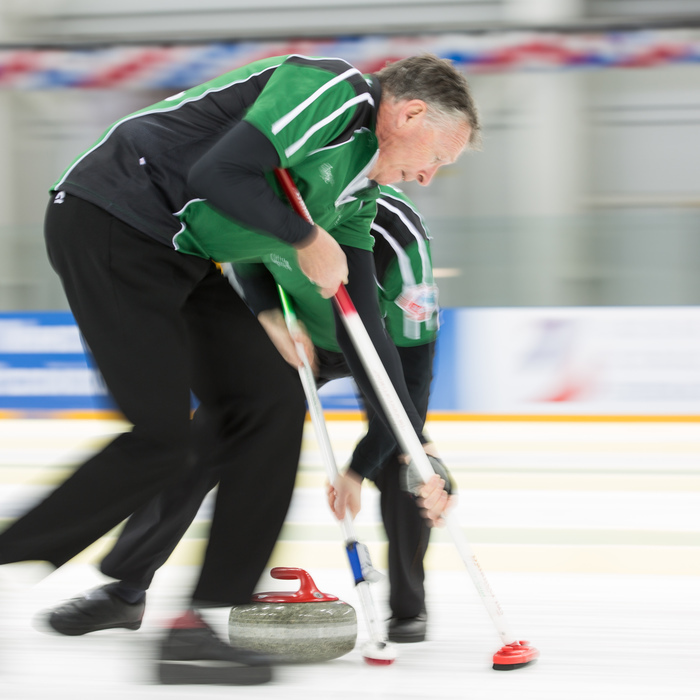 We tried to construct a multiple score in the 7th but the USA skip played a great last stone draw to force Bill to draw the shot for a single 6-3. We played a great last end and had the opportunity to lie three and make the US skip play his last but Bill’s attempted side tap on a winger was just fractionally heavy and the game was done..so were the boys!! We were totally shattered after that marathon and quite frankly it’s too much to expect Seniors to curl three games in a day at this level. I cannot understate the drive and determination that we showed all through the week and especially yesterday when our bodies were screaming at us to stop – well mine was anyway!! We never gave up even when things weren’t going our way and the teams we played against will be well aware of the fighting spirit of the Irish even when we were down to three men standing; as will anyone who saw us in action. We have had a fantastic week tinged with regret that the Big Man wasn’t with us physically-but he was definitely here in spirit. We have done ourselves proud and for me personally to stand in at the late stage for JJ was a huge step but I couldn’t have managed without the help and support of the Terrible Threequarters of the Fab Four. Thanks guys it was a privilege. 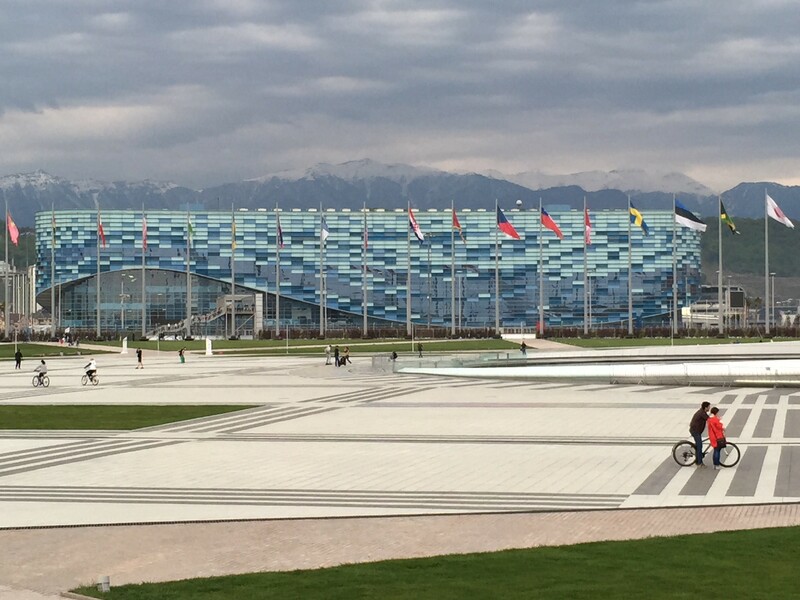 Last of the photos from the WCF official photographer taken today in Sochi. Methinks she was a Fyfe fan! 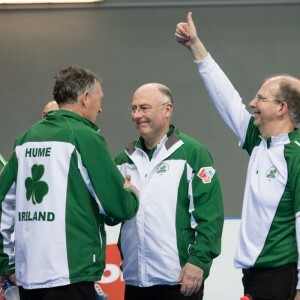 Ireland lose to USA – again! For the second year in a row Ireland went out at the world seniors’ quarter-final stage to the USA. It was a fantastic performance from Bill, Neil, David W and David H. They showed their mettle all week but particularly today when winning both their tie-breaker and qualifier. Three games at that level in one day is a big ask and they gave their all for their country, for their family and friends back home – and for their main man, Johnjo. We are all so proud of you all. Well done! 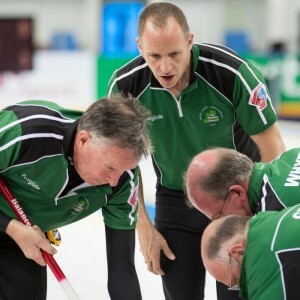 A three in the last end saw our boys get the better of the tough-as -nails Aussies led by Hugh Milliken to book their place in the quarter-finals tonight at 7pm (5pm here). But who do they play? Any ideas? Bill? Great result for our boys this morning and now fingers crossed for the high noon show down with Australia at 2pm (high noon here that is!). The winner gets a place in the quarter-finals. Come on IRELAND!!!! Tough day but still in it!! A shortened entry due to late evening team meeting. Hard game today against Scotland who played their best according to skip Gordon Muirhead after the game. We had some chances- particularly in the first end when a possible three was on but unfortunately Bills stone just caught the guard leaving us lying 1. 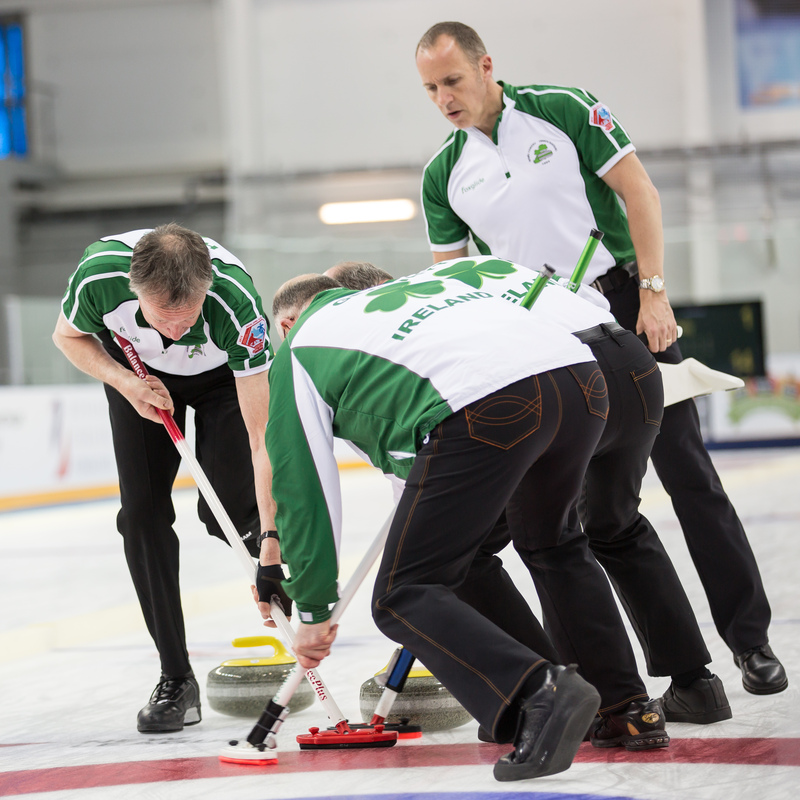 The second end started well enough with plenty of Irish stones in play but a wayward nose hit attempt left the Scots lying four. 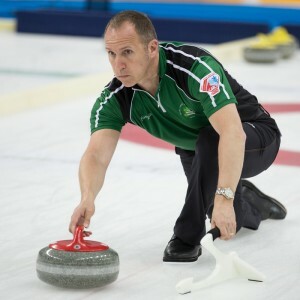 Bill played a great freeze attempt which ran a few inches too far and The Scottish skip played a great tap back to claim the four. We fought back well but ultimately we didn’t play as many good shots as our opponents who ran us out of stones in the eighth end to win 7-4. So where does that leave it all?? 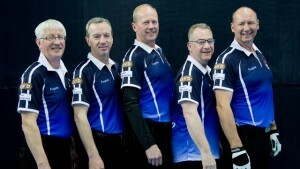 As the previous post states, we play Czech Republic tomorrow at 0900 in the Pool A tiebreaker. The winner of that game will play Australia in the QF qualification game at 1400. The third 3rd place team, Sweden has the best Draw Shot Challenge record of a 30.4 average and goes straight to the QF ( we had the 2nd best at 32.7!!). 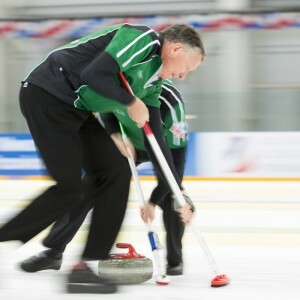 The winner of the qualification game will then play a QF against Canada, USA Denmark or New Zealand depending on how the draw is manufactured to avoid teams from the same pool meeting each other. Clear? It will get clearer as it unfolds. Anyway we have reached the playoff stages which was an early goal so it on!! More tomorrow when I have some time. 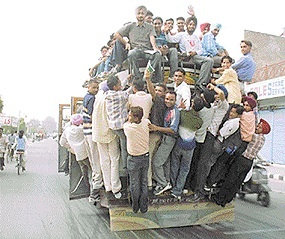 Still recovering from a bus journey back from Sochi centre which was so overcrowded it resembled the 5.30 from Mumbai to Jaipur as depicted in Michael Palin’s round the world adventure. There were only 24 seats in the bus and I reckon there were at least 60-70 on it at one point! 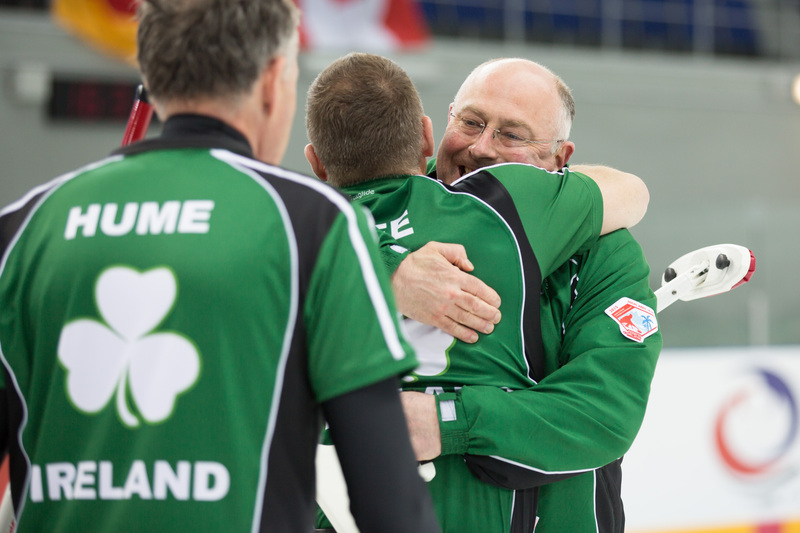 Ireland to play Czech Republic in Friday morning tie-breaker! 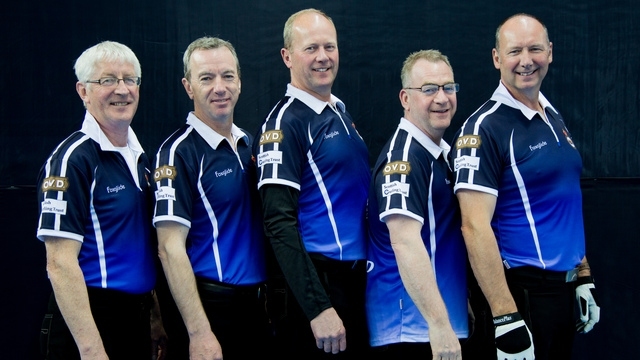 “Group A, Scotland faced Ireland and, helped by a score of four points in the second end, the Scots won by 7-4 to claim the second qualifying slot in this Group (behind unbeaten Canada, who sat this session out). 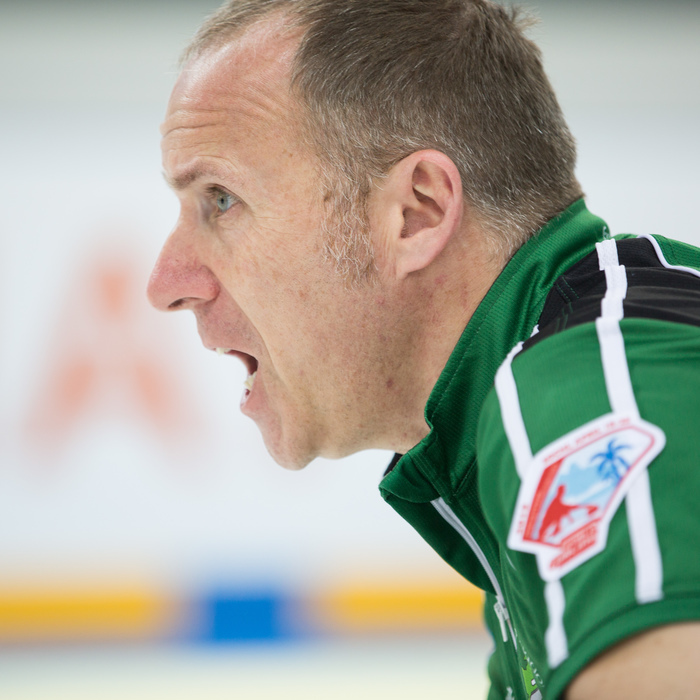 In the same group the Czech Republic beat Latvia by 5-4 after an extra end while Japan beat Kazakhstan by 18-0. Here is today’s WCF photo slideshow from the game against Scotland.